Leading the opposition to fill the vacancy is the ironically named Judicial Crisis Network, a Koch-backed organization. When President Bush was in office, JCN had the same acronym, but a different name and purpose – the Judicial Confirmation Network. 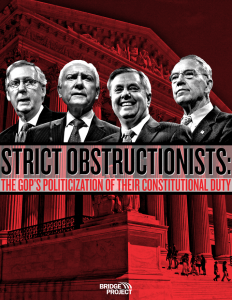 At the time, it advocated tirelessly for ending “the obstruction of judicial nominees” and called on (Democratic) Senators to “recognize the right of every nominee sent to the full Senate to receive a full and fair up-or-down vote.” JCN is joined by several lesser-known groups, particularly several funded by the Koch network and a variety of anti-choice organizations. These groups are desperate to keep the High Court to eight members for the next year and save the vacancy for a Republican president to fill, hoping that he or she will nominate a judicial activist who will overturn Roe v. Wade, gut environmental regulations, and wipe out workers’ rights.